Why do some portraits “feel” more friendly than others? We’ve spent a long time thinking about the question of why some portraits feel friendlier than others and we think we’ve figured it out… Especially when it comes to friendly business portraits. From a psychological perspective, relationships between strangers take place at a comfort level of about two to eight feet. Intimate relationships between siblings, between mother and child, between good friends and between romantic couples close the gap to a mere 18 inches. Between the two is the everyman’s land of “personal space.” It runs from two to four feet and is used by potential new friends and potential business associates. It is more impersonal in nature so it’s strange that it is called “personal space”. In other words, photos, depending on how they’re cropped, can give a false sense of intimacy to a viewer… a feeling that they know the person much better than they actually do… a feeling of “friendliness”. And that translates rather well into the viewer picking up the phone because your people look so open, friendly and approachable… even if said viewer can’t quite put their finger on why they feel that way. 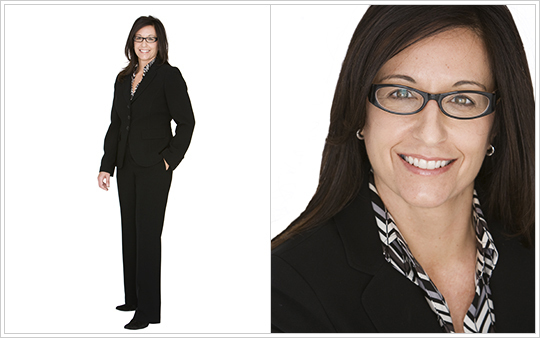 Friendly business portraits promote your company ahead of the competition (link to examples: headshots, executives or employees). Officially, Susan Goddard Photography creates dryer-fresh advertising, corporate and editorial imagery for advertising agencies, design firms, magazines, and corporations, both public and private. Unofficially, I've lived in the USA for 30+ years after narrowly escaping a rainy future in England. I can discuss American politics but not English ones, unless you count the politics of the school playground. I love chess. I've won one lottery (although there was no cash involved, just an elusive Green Card). I play six-degrees-of-separation for fun and find that in Denver, it's usually only two or three degrees (even if it's the President or a Hollywood movie star and sometimes it's one and the same). I have seen one low-flying, UFO in broad daylight. I am completely in love with my dog, Bodhi, who lives up to his name in every way (a being of wisdom and enlightenment). I am bummed (how's that for eloquence) that neither DaVinci or Einstein are still anchored to Terra Firma because I'd love to meet them, sit around a fountain somewhere (hopefully with an Americano in hand) and ask them what their take is on "Life, The Universe and Everything"... (Thank you Douglas Adams.) I love "Game of Thrones", "Homeland" and all things "Shameless". And I love being in the business of photography.